SAN FRANCISCO — California, known for its far-ranging suburbs and jam-packed traffic, is close to adopting a law intended to slow the increase in emissions of heat-trapping gases by encouraging housing close to job sites, rail lines and bus stops to shorten the time people spend in their cars. The measure, which the State Assembly passed on Monday and awaits final approval by the Senate, would be the nation’s most comprehensive effort to reduce sprawl. It would loosely tie tens of billions of dollars in state and federal transportation subsidies to cities’ and counties’ compliance with efforts to slow the inexorable increase in driving. The goal is to encourage housing near current development and to reduce commutes to work. Gov. Arnold Schwarzenegger, a Republican, has not said whether he will sign the bill. 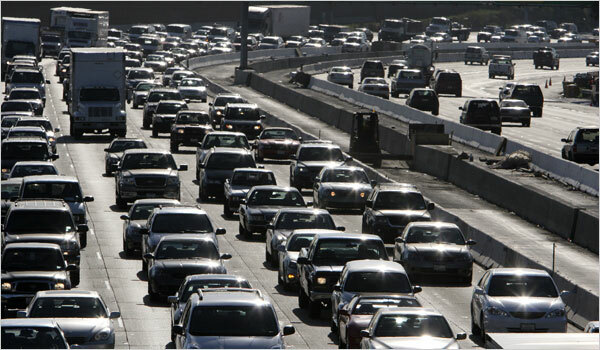 The number of miles driven in California has increased at a rate 50 percent faster than the rate of population growth for the past two decades. Passenger vehicles, which produce about 30 percent of the state’s heat-trapping gases, are the single greatest source of such emissions. The fragile coalition behind the measure includes some longtime antagonists, in particular homebuilders and leading environmental groups in California. Both called the measure historic. The bill yokes three regulatory and permit processes. One focuses on regional planning: how land use should be split among industry, agriculture, homes, open space and commercial centers. Another governs where roads and bridges are built. A third sets out housing needs and responsibilities — for instance, how much affordable housing a community must allow. Under the pending measure, the three regulatory and permit processes must be synchronized to meet new goals, set by the state’s Air Resources Board, to reduce heat-trapping gases. Seventeen regional planning groups from across the state will submit their land-use, transportation and housing plans to the board. If the board rules that a plan will fall short of its emissions targets, then an alternative blueprint for meeting the goals must be developed. Once state approval is granted, or an alternative plan submitted, billions of dollars in state and federal transportation subsidies can be awarded. The law would allow the money to be distributed even if an alternative plan fails to pass muster. State Senator Darrell Steinberg, a Democrat who is sponsoring the bill, said in an interview that he expected the Senate to approve the bill soon. Environmentalists have long blamed profit-driven land-use planning around the country for creating the expansive, sometimes redundant network of roads that have carved up farmland near urban areas. They have also praised regional planners in Portland, Ore., for that city’s clustered growth and pedestrian- and bicycle-friendly communities. The tools Portland planners have used are called urban growth boundaries, efforts to control sprawl by encouraging higher density development within an area and largely prohibiting it outside. These boundaries have gained little traction in California, where developers have seen them as too restrictive and local governments have been jealous of their own planning powers. Sacramento and San Diego have recently tried to build coalitions to support clustered development. Most environmental groups strongly support the pending bill. Among them is the Natural Resources Defense Council, a major force in the development two years ago of the landmark state law to limit heat-trapping emissions from all sectors of the economy. But some groups have expressed reservations, objecting to the relaxation of some existing environmental constraints on developers. Jan Chatten-Brown, an environmental lawyer in Santa Monica, wrote in an e-mail message that the bill “gives up an important tool” by relaxing some requirements of the California Environmental Quality Act and making it harder for citizen groups to sue developers. Communities that take part in the process will be able to revise their housing plans every eight years instead of five; developers working with a state-approved plan will have to do less extensive environmental reviews of their projects. Ms. Chatten-Brown also said the legislation overlapped with some of the provisions of the 2006 law committing the state, by 2020, to a 30 percent reduction in the projected level of emissions of heat-trapping gases. The Natural Resources Defense Council and the League of Conservation Voters estimate that $15 billion to $20 billion in annual federal, state and local transportation grants support highways, bridges, bike paths and light-rail systems. Because there is no assurance that regions would lose transportation dollars if their plans fail to win state approval, a few environmental groups stayed in a neutral corner. Following meetings earlier in the year in Bangkok, Thailand, and Bonn, Germany, the next round of United Nations Framework Convention on Climate Change (UNFCC) climate negotiations has switched continents yet again. More than 1600 delegates from 160 countries started week-long talks in Accra, Ghana on 21 August. 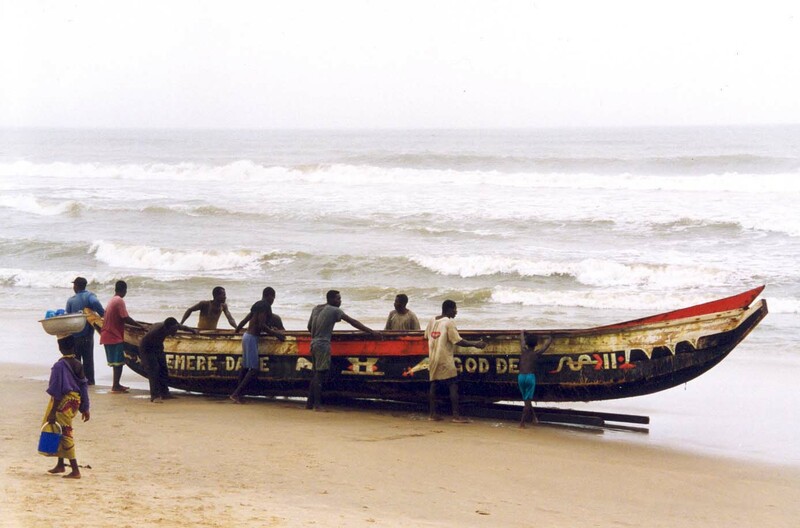 Ghana is already experiencing some of the impacts of climate change. Rainfall in the country has decreased by 20% over the last 30 years, and up to 1000 km2 of land may be lost in the Volta Delta due to sea-level rise and inundation if greenhouse-gas emissions continue to rise at the current pace. So, what’s on the agenda at the meeting? Firstly, there are talks on further commitments for developed nations that have signed up to the Kyoto Protocol, the first phase of which expires in 2012. These aim to “clarify the tools and rules available”, as well as to identify options to enhance their effectiveness. According to the UNFCC, such tools include emissions trading and project-based mechanisms; land use, land-use change and forestry; greenhouse gases sectors and source categories; and possible approaches targeting sectoral emissions. The plan is to conclude these negotations in Accra, enabling the setting of emission reduction ranges in December. Meanwhile, two workshops in Ghana are examining sectoral approaches, and deforestation and forest degradation. Sectoral approaches involve reducing emissions in key sectors of the economy, such as electricity generation and the energy-intensive industries of cement, iron and steel production. The policies are being championed by Japan, but have met some resistance from developing countries who fear that they may be a means of introducing trade barriers against less efficiently manufactured products. The second workshop is looking at policy measures and positive incentives to reduce deforestation and forest degradation in developing countries. Countries are at different stages of deforestation, which accounts for about 20% of greenhouse-gas emissions worldwide. For example, Brazil and Indonesia currently have high rates of deforestation, nations in the Congo basin have low rates but there’s a strong risk that rates will rise, and Costa Rica has taken measures to dramatically lower its historically high rates. Next the negotiations will head back to Europe, with Poland’s Pozna&nacute; the location for the UN Climate Change Conference in early December. One year later the framework for long-term cooperative action on climate change is due to be finalized in Copenhagen, Denmark. Let’s hope that the change in US leadership that will have taken place by then eases the way to some definite commitments to large-scale cuts in greenhouse-gas emissions from both developed and developing nations. • The IPCC will celebrate its 20th anniversary just before its 29th plenary meeting in Geneva next week. in this city’s long-struggling Over-the-Rhine neighborhood. package, fares may be free, 50 cents or $1. Mark Mallory, a proponent, and the City Council. passengers per car on rails that are flush with the pavement. passengers on either side, making for shorter stops than buses. added new lines interlaced with a growing light rail system. Streetcar Inc., which operates the system. bringing services and businesses to one area. financed a regional light rail system. emphasizing streetcars’ ability to revitalize urban neighborhoods. and Charlotte, Dohoney became convinced that they spur growth. and downtown parking and a $12.5 million contribution from Ohio State. As renewable energy technologies become more competitive, investing in them is becoming a more viable venture. Yet, uncertainties about cost and ROI are still keeping some investors at bay. Wind blows, rain falls and the sun shines, but differently at different times and locations, making wind, hydroelectric and solar power dependent upon weather and climate systems. A new Northwest-based energy efficiency company, 3TIER, is using their science skills and computer smarts to remove some of that guesswork. Over 90 percent of the renewable energies used for electricity generation are weather-driven; in other words, they are completely dependent on the weather/climate system for their fuel. So while these sources of renewable energy have the capability to liberate us from our dependence on fossil fuels, they introduce another complicating dependency: the weather. This dependency affects all aspects of weather-driven renewable energy projects: from proper placement to ongoing operation and integration. This map of the United States shows the amount of available solar power, ranging from from 4 (blue) to 5.5 (red) kWh/m/day. The 3TIER team uses their technology-assisted powers of analysis to calculate the weather and climate and its impacts on renewable energy. The group customizes their forecasts with data from each client’s site to help them save money and optimize power. They take multiple readings from the site, for an extended period of time, and combine the reading with weather and climate knowledge for that region to tell wind farmers, for example, an estimate of how much energy they’ll be generating, and at what time. The group recently finished helping oilman turned renewable energy propent T. Boone Pickens illustrate his national plan to help propel the U.S. energy economy with wind. Using wind maps from 3TIER, the Pickens Plan explains how the U.S. can use wind power to meet more than 20 percent of its electricity demand within 10 years. (View a video about the plan here). 3TIER is currently working on a project called REmapping the World, which combines their prediction technology and analysis with Google maps to assess solar and wind energy potential from locations around the world. So far, they have mapped North America, but they plan to map the renewable energy potential of the entire world by 2010. Take a FirstLook at the project’s “Find Wind Fast” function. Here clients from renewable energy project operators to developers, financiers to marketers, can select the height of a proposed turbine and its location to get an estimated read on how much wind power is in that area. For more exact details, clients can order custom reports that provide information like monthly windspeed and power capacity, hourly windspeed and power distribution and more. But you don’t need to be one of their clients to play around with the maps, and it is pretty fun to look at the potential from afar as well as to click around and see how much specific potential lies where. Potential just happens to be the perfect word to describe this project, this company and the renewable energy movement. Being able to more accurately estimate how much we can depend on renewable energy systems will only aid in their much needed proliferation, and hopefully, forecasting where the wind will blow will only become more valuable with time. You are currently browsing the Ecocity Media blog archives for August, 2008.